Control Process S.A. as the company specialized in realization of technologically advanced investments applies procedures of Integrated Management System which constantly provide the highest quality of services and offered products. Below we submit our certificates of management systems which confirm implementation of the highest standards accordingly to international norms. Control Process has got Integrated Quality Management System consistent with the norm ISO 9001:2015, it was confirmed by the proper certificate. Implemented Integrated Quality Management System was developed in order to provide the highest quality of services and offered products. Implementation by Control Process the Environmental Management System consistent with ISO norm 14001:2015 which is the confirmation of the company’s involvement in the natural resources & environment protection and conducting activities in a way to have low influence on natural environment. The result of implemented certified system is the improvement of efficiency, reduction of produced waste, the rise of the knowledge of employees in the scope of environmental protection and the estimation of subcontractor’s activities which influence the environment. 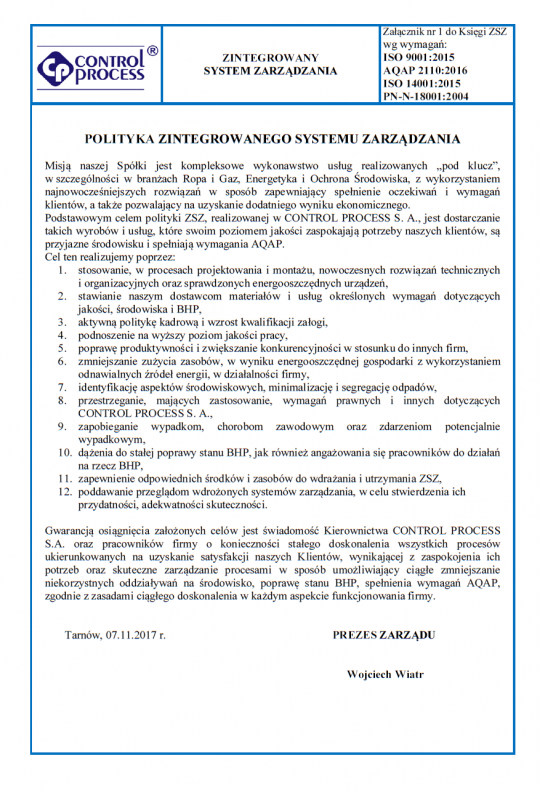 Control Process on November 2, 2017 has been certified according to PN-N-18001: 2004 Safety Management System. The implemented system allowed to organize and systematize all activities related to the safety and health of work in the Company, documenting the involvement of both management and each employee in real workplace safety. Norms AQAP (Allied Quality Assurance Publication) refer to standards applied by NATO. Holding a certificate of conformity of conducted activities with the norm AQAP 2110:2016 enables Control Process to realize investment projects with the quality required by NATO entities.